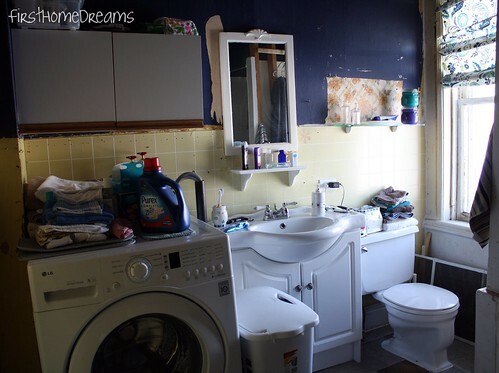 With all my talk of the bathroom lately, I don't think I've ever really shown what it actually looks like right now. Bad is an understatement. How about a tour? 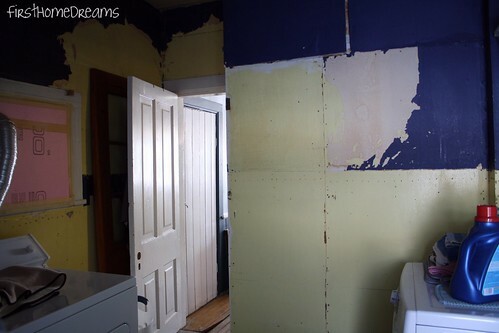 The bathroom is off of the kitchen, just past the door to the basement. 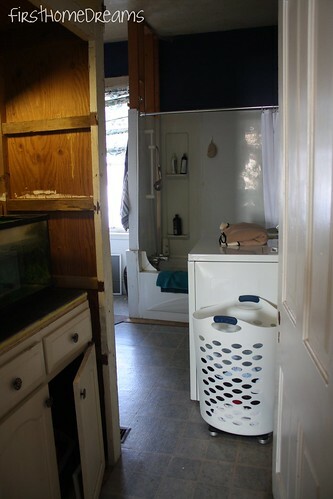 To the left is a closet, which we removed the doors from to tuck the turtle tank out of the way. At the back of the closet is the hot water tank, which we will be moving to the basement. Right in your path as you move forward is our dryer (not the dryer that goes with our stacking laundry pair - we'll be Craiglisting/Kiji-ing this hefty sucker). Our ceilings are just over 9.5', and as you can see, the people who smacked this bathroom together didn't bother with the top of the shower/tub alcove. Who doesn't love the look of 2x4's in the bathroom? Notice the five different wall treatments above. Can you spot them all? The sink, cabinet, and toilet will be going to our local Habitat for Humanity Restore. I do love my no-sew roman shades, though! Speaking of the toilet, it's from 1964 (according to the tank lid) and is probably the first toilet that this house ever had. It's also sort of falling through the floor into the basement right now. No big deal. 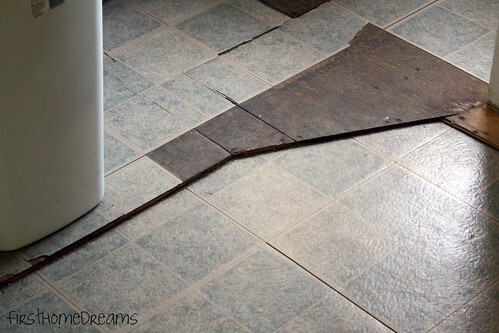 And the floor? Well, I don't even know what to say. The plumbing to the tub leaks, and the very sanitary piece of knotty pine is discoloured with water stains. 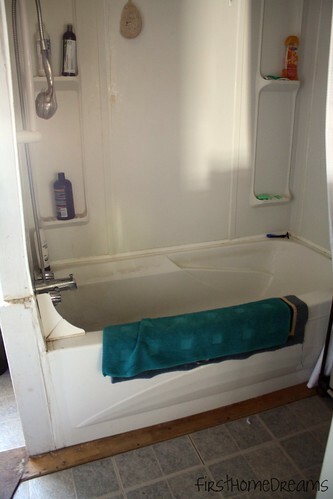 The tub and alcove itself are just...gross. There's no other word. Maybe disgusting. And cracked. The alcove has a big huge crack in it that was patched with packing tape. 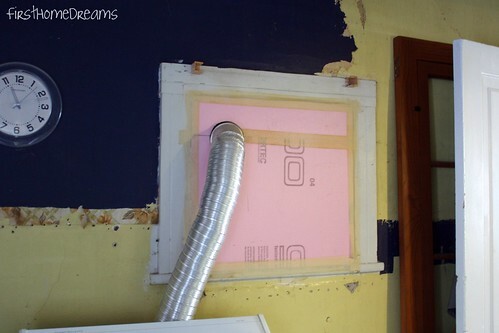 The monstrosity of a dryer is vented out what used to be a window. By the time we're done in here it will be a window once again. You can see my refinished storm door to the right behind the bathroom door. That concludes the tour. Feel free to run away now!